Not only that, Willie - who hates terrorists so much he once shared a stage with sectarian psychopath Billy Wright - wanted to drop bombs on Crossmaglen on the northern side of the border. At the same conference Gregory Campbell, a man who has not mellowed with age, is said to have wanted Maryfield - the Anglo Irish secretariat building in Belfast - demolished “foundations and all”. Files released from the public records office also reveal that figures within the DUP were conspiring against Peter Robinson - no change there then. 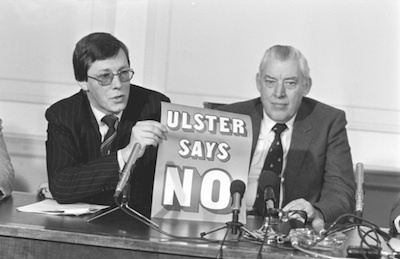 Jim Allister, it has been revealed, found himself rather awkwardly sitting beside an NIO official on a London train during a unionist boycott of the office in the wake of the hated Anglo-Irish Agreement.